Former international and Selangor cricket and hockey player Michael Francis "Mike" Shepherdson passed away this morning. 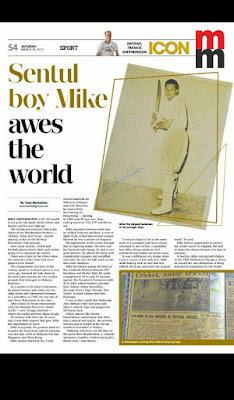 Mike represented Malaya in the 1956 Melbourne Olympics where he earned the rare distinction of being selected by journalists for the World XI team – the first Malayan to achieve this. He went on to represent the nation at the Asian Games in Tokyo in 1958 and in Jakarta in 1962 where Malaysia won a bronze medal. 2011 was inducted to the Olympic Council of Malaysia’s Hall of Fame for his sporting achievements. Address: 38, Jalan Tempines 2, Lucky Gardens, Bangsar, K.L. Funeral to be held on Thursday (18th Feb) at Fatima Church Brickfields at 11am. Body will be at home till Thursday morning. 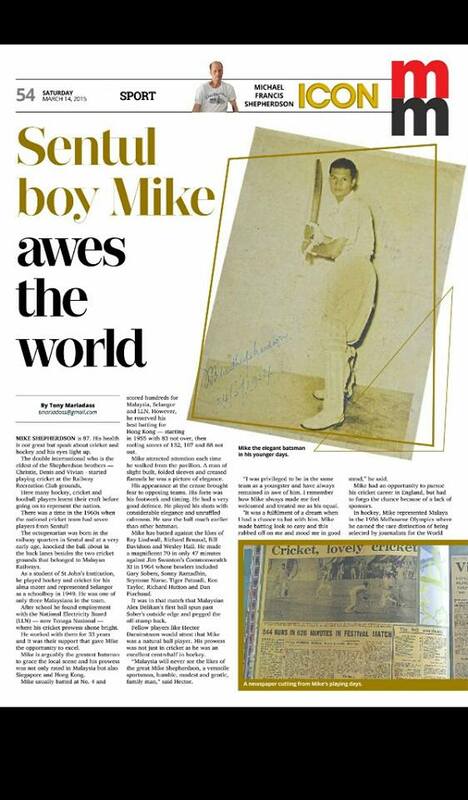 Mike Shepherdson as he is better known, is 87 and his health not in the best, but speak about cricket and hockey to him and his eyes light up. The double international who is the eldest of the Shepherdson brothers Christie, Denis and Vivian, started playing cricket at the Railway Recreation Club grounds, which was a breeding ground for many other hockey and cricket players and also football who went to represent the nation. 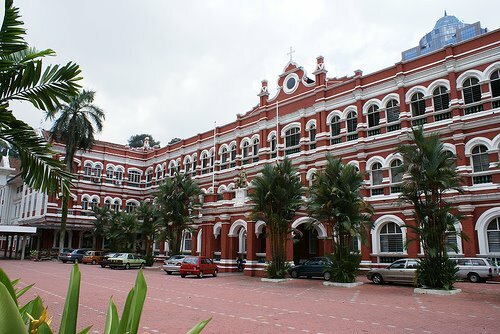 As a student of St John’s Institution, he played both hockey and cricket for his alma mater and represented Selangor as a schoolboy in 1949. He was one of the three Malaysians in the team when he played. 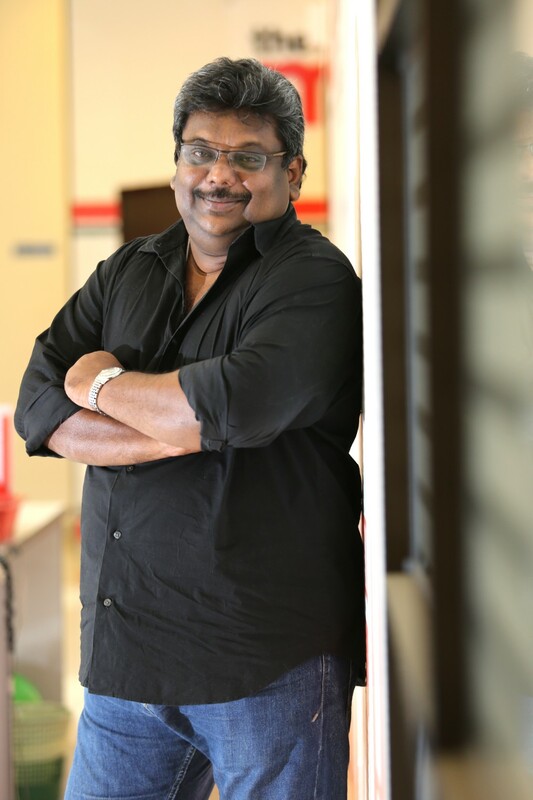 After school he found employment with the National Electricity Board (LLN) – now Tenaga Nasional – where his cricket prowess shone further. He worked with them for 33 years and it was their support towards sportsmen and women that gave Mike the opportunity to excel. 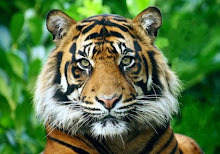 Mike usually batted at number four and scored hundreds for Malaysia, Selangor and LLN. However, his best batting was against Hong Kong starting in 1955 with 83 not over, then reeling scores of 132, 107 and 88 no. Mike attracted attention each time he walked from the pavilion. While he was a sight to behold when in full flight, each time he walked in to the middle, he held court. A man of slight built, folded sleeves and creased flannels was a picture of elegance. His appearance at the crease brought fear to opposing teams. His forte was his footwork and timing. He had a very good defence. He played his shots with considerable elegance and unruffled calmness. He sees the ball much earlier than other batsman. Mike has batted against the likes of Lindwall, Richard Benaud, Davidson and Wesley Hall. He made a magnificent 70 in only 47 minutes against Jim Swanton’s Commonwealth XI in 1964 whose bowlers included Gary Sobers, Sonny Ramadhin, Seymour Nurse, Tiger Pataudi, Ken Taylor, Richard Hutton and Sri Lanka spinner Dan Piachaud. It was in that match that Malaysian Alex Delikan’s first ball spun past Sober’s outside edge and pegged the off-stump back. 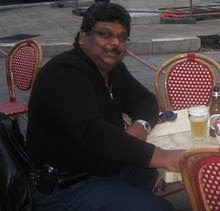 Fellow players like Hector Durairatnam would attest that Mike was a natural ball player and his prowess was not just in cricket, was an excellent centre-half in hockey too. “Malaysia will never see the likes of the great Mike Shepherdson, a versatile sportsman, humble, modest and gentle, family man,” said Hector in a tribute to Mike. Mike had an opportunity to pursue his cricket career in England, but had to forgo because of lack of sponsors. Mike idolises the stylish English batsman Tom Graveney. 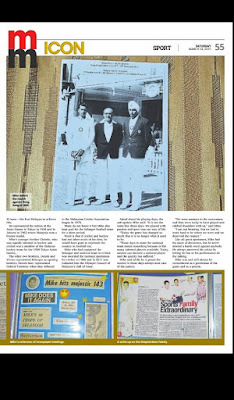 In hockey, Mike represented Malaya in the 1956 Melbourne Olympics where he earned the rare distinction of being selected by journalists for the World XI team – the first Malayan to achieve this. He went on to represent the nation at the Asian Games in Tokyo in 1958 and in Jakarta in 1962 where Malaysia won a bronze medal. Many may not know, but Mike also played football keeping goal for Selangor for a short period. Word is that if cricket and hockey had not taken much of his time, he would have gone to represent the country in football too. 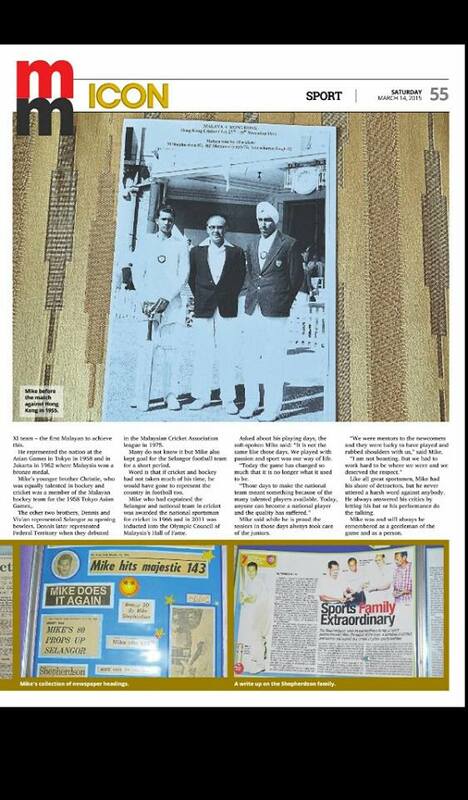 Mike who had captained the Selangor and national team in cricket was awarded the National sportsman for cricket in 1966 and in 2011 was inducted to the Olympic Council of Malaysia’s Hall of Fame for his sporting achievements.